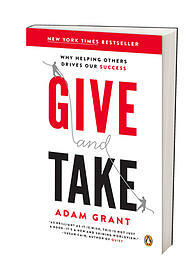 The heading of this article and the above question are taken from the book Give and Take by Adam Grant. He argues, “Giving, taking and matching are three fundamental styles of social interaction.” He continues by writing, “Evidence shows that at work, the vast majority of people develop a primary reciprocity style.” It says that each of us has a different mix of the 3 fundamental styles. In business life you will meet many takers, who try to use your resources for their own benefits. In time you develop the necessary tools to recognise them and can establish methods on how to keep them away from you. The hardest type to recognise is the taker who behaves like a giver. Those are usually also the ones that you lend your hand to, just to see shortly thereafter that you have lost an arm. How to be sure about somebody’s reciprocity style? Adam Grant tells that even total strangers, supplied with the Facebook profiles of a chosen group of people, could detect the takers in that group with astonishing accuracy. My additional advice would be to talk to someone from their ex-relationships: ex-spouse, ex-partner, ex-supplier etc.